When I first created my blog, the original url I came up with was postconfidential - don't ask - it was some kind of LA Confidential thing but in NC. Then the title of my blog was something like Between You and I. Who was I talking to? No one at the time. Who was going to read it? No one with a title and URL like that. I came up with sporadicpublication because that's all I had in me at the time (a sporadic post) butpublication sounded better. 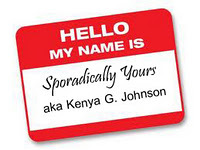 I absolutely love that name now because with it, I'm only committed to writing sporadically. Yet with over 171 pageviews yesterday (toot toot), I felt like I had to explain myself today (just in case anyone came back). Long time bloggers are saying, "Isn't that cute" (at my pageviews). But I was thrilled to pieces and I am going to try not to become a pageview stalker. The title of my blog, Here's the thing... came from a favorite show, Monk. I am not sure if he said it in every show, but "Here's the thing" usually preceded a long explanation for something he had figured out. I'm not using it quite like that, but I liked it.